Petronas Towers is the landmark of Kuala Lumpur, Malaysia. From this tower, Kuala Lumpur is a scene from a height of hundreds of meters. 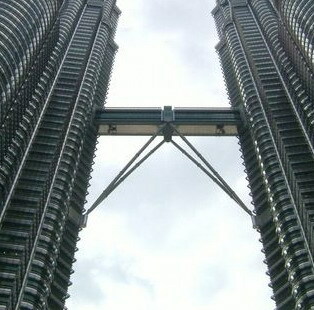 Kuala Lumpur has not been valid, if you have not visited the Petronas Towers. A tower of 88 floors, designed by Cesar Pelli in 1998. 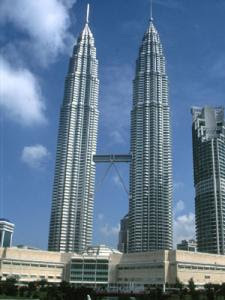 Petronas towers that had become the world's tallest building, has 88 floors, with a height of 452 meters. Between the two towers were built a bridge (Skybridge) that connects the two towers at 41 floors. Skybridge is open to the public, but only from the tower alone. To enter Skybridge, visitors charged a rate of about RM 50, In addition, you should first have to look at the schedule listed in the ticket has been purchased. Because, not every time Skybridge is open. It is recommended to buy tickets a day before boarding the Skybridge. Go to the Skybridge, you will ride the elevator up to floor 41 of the base height of approximately 170 meters. The visitors were given only about 10-15 minutes to take pictures at the top along the 58.4-meter Skybridge. From the Skybridge, you can see the garden and pool on the ground floor of Petronas. Long as the eye could see, the buildings of skyscrapers in Kuala Lumpur we can see. Next, you will be brought to the floor 86 to back up the elevator. On this floor, visitors can see the City of Kuala Lumpur using the binoculars that are available. Wow, cool! Because even in the height of hundreds of meters, the buildings around it can be seen nearby. There's also a miniature city of Kuala Lumpur and the Petronas Towers miniatures. Oh yes, prepare your ticket too. With direct flights to the three television screens on the wall, on a television screen image will appear three-dimensional description of the Petronas Towers and Petronas matter. Cool is not it? Remember yes the tickets are routed to the television is part of the existing bar codes. Petronas Towers are an icon of the city of Kuala Lumpur. Petronas Towers to take photos as a whole, you have to walk a few hundred feet away from this tower. Downstairs the Petronas Towers, there is a mall called Suria KLCC. In addition to shopping, for those who bring small children, take your kids to the KLCC Park. There was a small swimming pool and playground.